Dental damage doesn’t need to affect your daily life. Bonding is a great option for those with decayed, chipped, fractured, or discolored teeth. This means you can restore your smile in one simple visit and leave feeling confident! 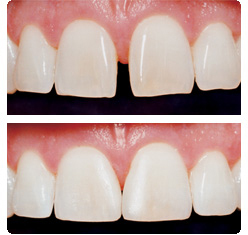 Dental bonding involves the application of a tooth-colored resin for a natural-looking repair. Often used for cosmetic purposes, resin can be applied and shaped to match the surrounding teeth. It is used to change the shape – including filling gaps – and color of teeth. To begin, you will need to schedule an appointment with your dentist to discuss your goals. They will use a shade guide to color match the resin to your natural tooth color as closely as possible. When a color is chosen, the tooth or teeth affected will be etched to create a better bonding surface area. A conditioning liquid will help the bonding material adhere. Then, the dentist will apply the putty-like resin. This is then shaped and hardened with an ultraviolet light or laser. Once the material is hardened, the shape will be finalized and polished. The procedure takes roughly 30 minutes to an hour for each tooth. You may need more than one appointment for multiple teeth. If you’d like to explore dental bonds as an option for your oral hygiene, please contact our team at Country Isles Dental to schedule an appointment.